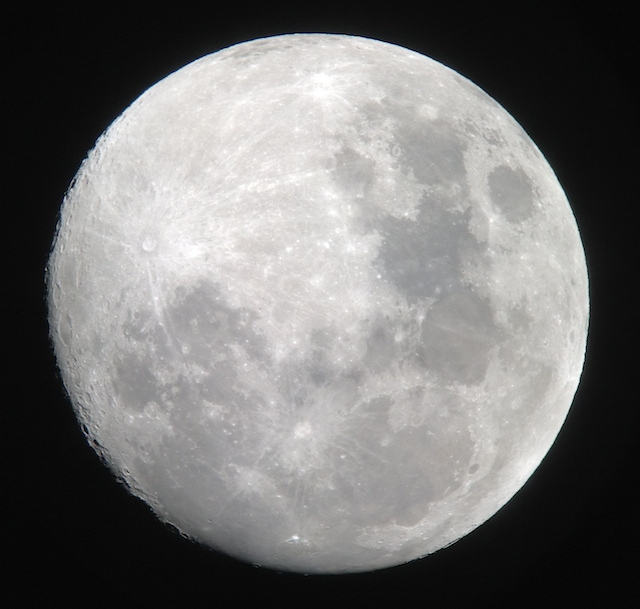 As an amber moon floats above the desert in Australia’s Red Centre, a humble man, away from his workshop, stands and bows to the clapping crowd. A luthier, repairing violins, cellos and violas, he’s had what must be one of the most unique assignments of his career. In the desert heat, the parched body of a stringed instrument will bulge and warp, put out of tune by nature, and as the warm, disjointed sounds of orchestral tuning taper, several musicians hold up their restored instruments in gratitude to the evening sky and to the eruption of applause. An audience of music-lovers — a jovial mix of connoisseurs and novices alike — sit on plastic chairs grouped in sections of price and privilege, sipping sparkling wine and scanning the program. 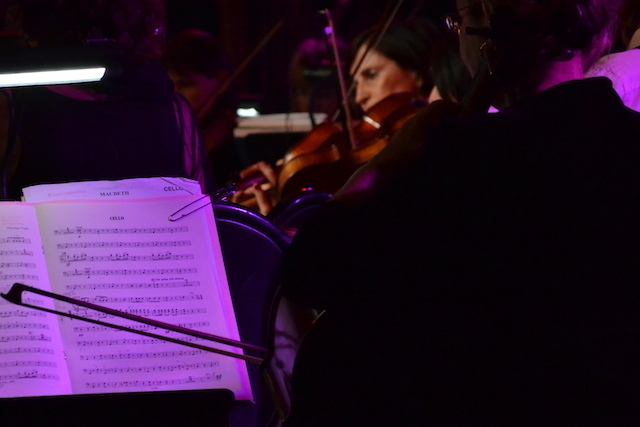 It is a charged scene, an ambitious offering of high culture by the Darwin Symphony Orchestra and guests from the Aboriginal community, set in the quiet isolation of Uluru-Kata Tjuta National Park, and nestled next to one of the world’s most recognized natural wonders, Ayer’s Rock. The Concert at Uluru brought me to the Outback, along with a few hundred ticket holders, 130 volunteers and a collection of expert musicians, some from halfway around the world. But when I arrived, numbed from the buzzing of jet engines, I struggled to muster expectations of what was in store for the week. I needed some context. I dropped my single bag in the hotel room, and set out immediately to get sunburned and cultured. 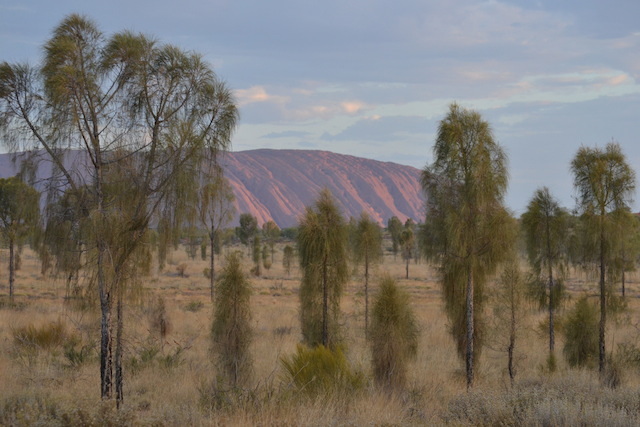 Cassidy Uluru is a lanky, timid Aboriginal man with a striking face reminiscent of an ancient humanness almost lost in modern cultural memory. He tells stories about songlines and Dreamtime in Pitjantjatjara, his native language, and his big eyes are often lowered in a gaze toward the ground, not in embarrassment, but in accordance to Aboriginal social protocol. In the high summer sun, he stood at the foot of Ayer’s Rock and scratched symbols in the sand, and told us of the mischievous Lungkata, a blue-tongued lizard man, who came running from a far-off place, having absconded with a wounded emu. The story ended with a dead Lungkata, having succumbed to a fate of his own making, and the tale typified themes of loneliness, desperation and a poetic justice. What was striking about Cassidy’s story-telling was not his perpetuation of truisms by means of animal-human hybrids–practiced ad infinitum from Aeschylus’ swan-like maidens, to the snake-haired Gorgons, to Aesop’s articulate menagerie that held council meetings in the forest–but rather his literal interpretation of the story in relation to geological formations. The pits on the side of the Ayer’s Rock are the zigzagging footprints of the lizard-man. Grey marks on the rock wall, what the passing observer would call water deposits, are stains from the charred flesh of the dying Lungkata, ripped off and stuck to the rock, as he rolled down the face of the cliff. “He came from over there,” he said through a translator, pointing. 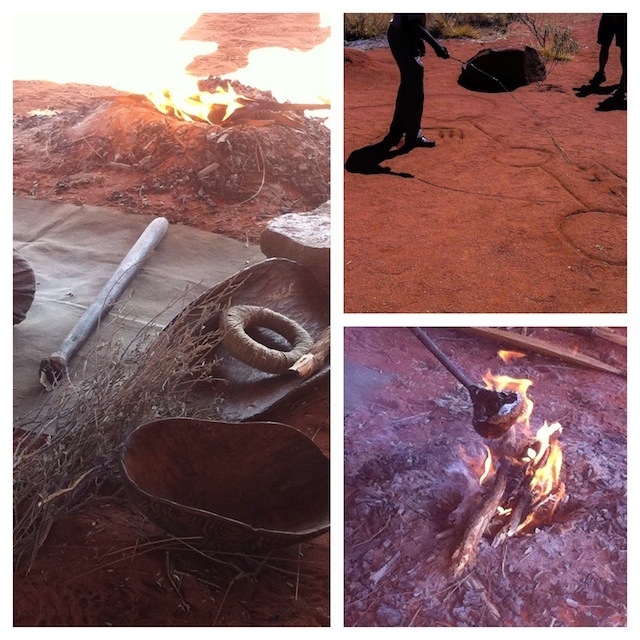 Cassidy’s parable is merely one of thousands in a patchwork of interconnected dramatic plays throughout the continent, teachable and steeped in animism, explicitly reverent to the flora and fauna of the Outback. The next day, my amateurish naturalist self began to bloom with the sight of a lone dingo, which was trotting casually across a washboarded road. It paused behind a patch of yellow spinifex grass, its upright ears pointed slightly forward. Before long, our guide Brett was again speeding along in the 4WD headed toward the border of South Australia. He wore khaki shorts, an expeditioner’s shirt and a wide-brimmed bush hat. He seemed to relish the opportunity to use his utility knife and he spoke fondly of his desert backyard. He pointed out flocks of green and yellow Budgerigars and Zebra finches, birds I had kept in cages as a child, which flitted by in freedom from bush to bush. Seemingly everywhere there were tracks and lines left from snakes, lizards, birds, kangaroos, and dingos. Without warning, Bret slowed the 4WD and jerked it into reverse. “I saw something,” he said. Lying dead on the road was a four-foot-long lizard, a Perenti, apparently just hit by a car. Brett got out of the jeep and paused for a moment, probably gauging our reactions. I bent down and felt its lose, beady skin. He picked up the carcass by the tail. “A shame to die so stupidly,” I said. The Belgian tourists behind me seemed to be taken aback, but I nodded in approval, remembering that Brett had referred to Perenti as “tasty ones” earlier in our conversation. He packed the lizard into a black trash bag; unfortunately only to discard it later after it had begun to bloat in the hot sun. By the time we were preparing our lunch in the bush, natural processes had already begun to return the body to the sand. We settled for campfire-griddled steak sandwiches. Our destination was Cave Hill, the site of the Seven Sisters Tjukurpa (the Yankunytjatjara version of the story of the Pleiades star cluster). Here Brett led us around a craggy rock mound, each of us holding a gender-specific Aboriginal hunting tool redolent of bygone nomads, and eventually to a cool hollow, housing cave drawings that date back to more than 20,000 years old. The sprawling collection of symbols had the appearance of an unfinished work–concentric circles, discordant paths, renderings of emu tracks, human footprints and anteaters–indeed it is still a work in progress, locals occasionally adding pieces to the story. Later that evening at the concert venue, we were treated with a healthy serving of Verdi’s opera oeuvre, Aida and Rigoletto; Richard Strauss; Modest Mussorgsky’s Night on Bald Mountain and even jazz standards from Duke Ellington and Hoagy Carmichael. I sat in my chair, mentally somewhere between the opera house and the campground, swatting the incessant bugs from my face. But this seemingly peculiar setting proved not to be peculiar at all. It highlighted, by its wilderness locale, the inherent qualities of Western music while translating to the public part of the beauty of indigenous life. And it worked, much to the credit of William Barton, a virtuoso in experimental music and an expert at fusing styles of European and indigenous musical arts. 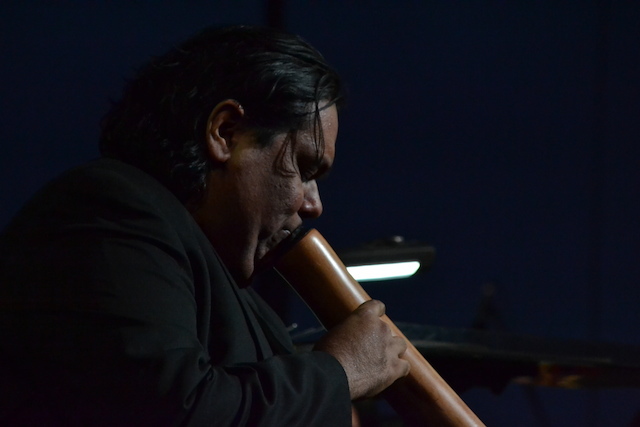 He plays the didgeridoo, the quintessentially Aboriginal wind instrument made of a eucalyptus trunk hollowed out by termites. Perhaps few musical pieces better exemplify a harmony of indigenous and modern than Earth Cry, from Australian composer Peter Sculthorpe, a seamless molding of didgeridoo and orchestral arrangements more genuine than its New Age title may suggest. 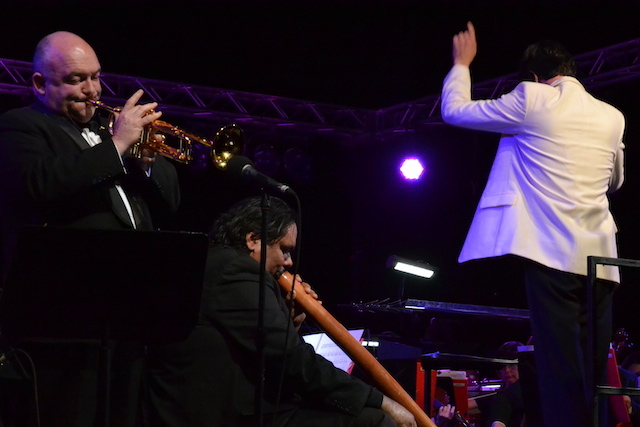 On the stage, Barton released the deep drone tones of his didgeridoo in the song, as he sat with his instrument nestled comfortably among the squinting faces blowing into trumpets and the delicate arms rocking bows over violins and cellos. The real beauty of the concert was that it seemed to transcend the discomfort, to render irrelevant any Western separation of nature and culture. 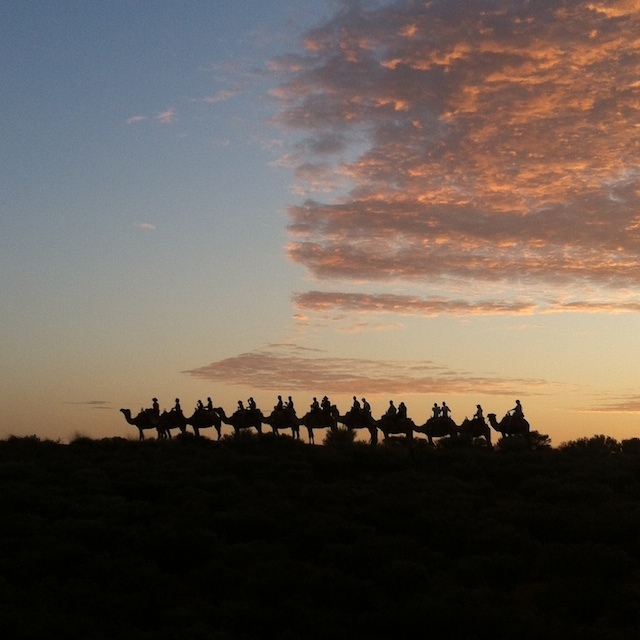 On my final morning in the Outback, sitting on the creaking saddle of a camel, the sun rose and lit the chilled darkness and I looked up at a soft lemon and salmon-colored blanket of clouds suspended above us. My groggy ungulate—arbitrarily named Diesel, an “excellent racing camel” apparently—paused to grunt. 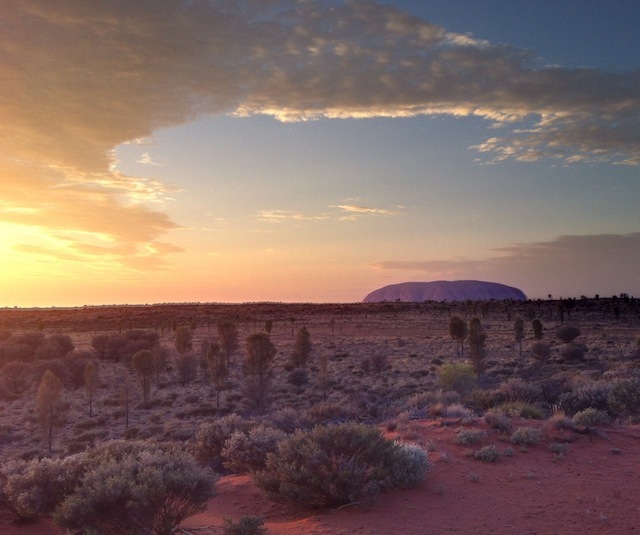 From this still vantage point, that reddish giant Ayer’s Rock, or Uluru as it’s been known for countless generations, seemed to be bulging out of the flat horizon, its warm glow rising into the sky. And perhaps the profound trumpets in Strauss’ Also sprach Zarathustra were still reverberating in my mind and in the air like an artful pronouncement of the presence of humanity in a feral world that has remained unchanged for centuries.